HOWLIN' TACO SERVES UP THE ONLY TRUE AUTHENTIC BREAKFAST TACOS FOUND IN NEW YORK CITY. 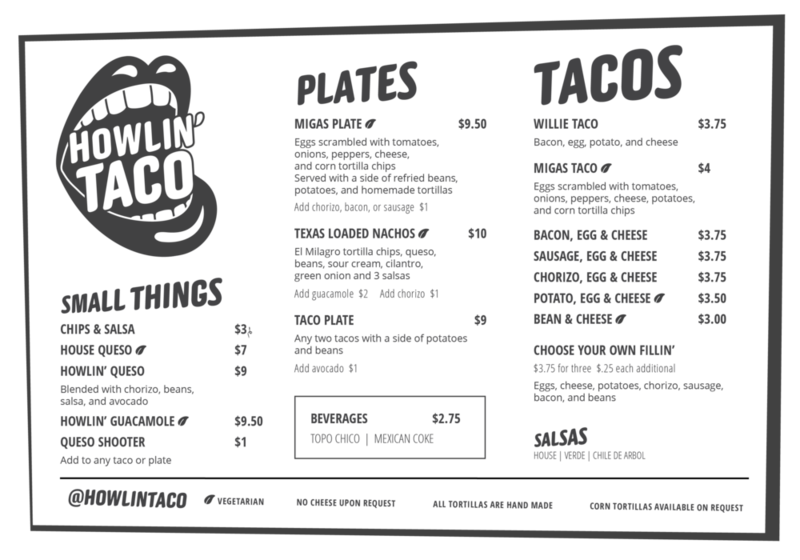 Owner William Thompson, born and raised in Austin, Texas, founded Howlin' Taco with a mission to get him to shut up to all his friends about how good the food was back home and just make it for 'em instead. We use the simplest and best ingredients to create everything in house, from our homemade hand-rolled tortillas to our way too addictive salsa. We use real deal traditional Tex-Mex recipes done right!